All Kindergartners will have two sessions with the visiting artists. The first will be a buddy session with 6th grade students. The second will be during regular kindergarten art time (see schedule for details). Artist will read One written by Kathryn Otoshi with students. Artist and students (including sixth grade “buddies”) will discuss & explore guiding questions aboutfeelings, bullying, standing up for others, etc. as a group. K students will pair with 6th grader buddies to brainstorm and develop a draft page of responses toquestions. Goal: 2-3 “messages of kindness & peace” for each buddy pair. 6th graders assist kindergartners in writing messages on prepared strips of fabric. Kindergartners usepencil first, 6th students go over this with permanent marker. As time allows, K & 6th students may work in larger groups of buddy sets and select from thesupplemental books provided; read then discuss these “messages of kindness & peace”. The artist will first demonstrate steps for students and model for classroom volunteers. Fold fabric strips accordion style and secure with paper clips or rubber bands. Take off the paper clips or rubber bands and unfold the first strip. Paint additional blue watercolors onto the white areas of the fabric strip and set it aside. Hang to dry; repeat with additional strips as time allows. Students may benefit from exploring the guiding concepts listed each week of the residency schedule, and through other classroom activities related to bullying and peacemaking. See the book list on our google doc and books selection in the MLS library. 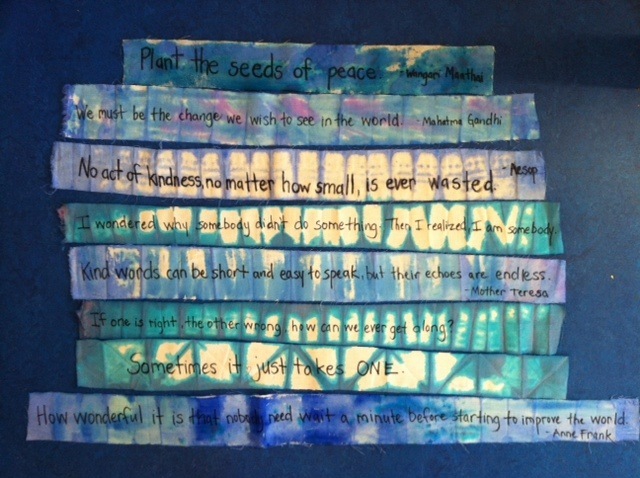 Kindergarten students will take their draft pages of “messages of kindness & peace” with them after art session one. Teachers may wish to extend these student-developed concepts into discussion, role-play or picture making activities.